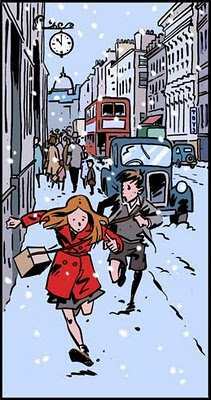 One winter’s day, during the height of the Blitz, two young children — Amelia and Rory — run through London’s streets, en route to a nearby train station to meet Amelia’s aunt. Amelia spies a bookshop, and they hurried enter, so that she can buy a book she can read on the train. The bookshop is crammed to the rafters with books of all shapes and sizes, and its proprietor is a daft and absent-minded young man who calls himself “the Professor.” But there is nothing ordinary about the bookshop or its proprietor, as Amelia’s curiosity sends the bookshop on a journey through space and time to a world where an evil and oppressive White Witch has turned a magical land into a place where it is forever winter and never Christmas. Every month, Doctor Who Magazine runs an eight-page comic strip. The comic strips are legendary among fans, and they’ve written and drawn an all-star line-up of creators, including Dave Gibbons, Alan Moore, Steve Moore, John Ridgway, and Grant Morrison. Fan-favorite characters like Frobisher, the shape-shifting penguin, and Izzy debuted in the comic strip, and storylines such as “The Iron Legion,” “Voyager,” and “The Tides of Time” are still talked about today. I would even go so far as to say that Steve Parkhouse, the writer of the mid-80s comic strips, is one of Doctor Who‘s top three writers, rivaled in his creativity and breadth of vision only by Robert Holmes and Steven Moffat. The comic strip in Doctor Who Magazine #429, the latest issue to reach American shores, reteams Jonathan Morris and Rob Davis, the team behind “The Time of My Life,” for a story that, if you can’t tell from the first paragraph, reimagines C.S. Lewis’ Chronicles of Narnia as a Doctor Who story. Narnia, for me, isn’t a particularly compelling world. Years ago, when discussing Disney’s adaptation of The Lion, the Witch, and the Wardrobe, I wrote: “C.S. Lewis could put together a sentence, construct a scene, but his plots were rubbish. He’d make a lousy reporter — he could answer the who and the how and the what and the where, but never the why. Things happen in Narnia, but they never make a whole lot of sense, because Lewis never explains why they’re supposed to make sense. Sure, it’s fantasy, but it should have at least a modicum of sense.” One particular problem I have with Lion is the appearance of Father Christmas; how can a world without Christmas even have a Father Christmas — and wouldn’t he be Father Aslanmas in any case? Narnia has no rational construction; it’s just a melange of different myths and stories, all tossed into a pot. That was the reason for J.R.R. Tolkien famous dislike of Narnia; for Tolkien, the stories weren’t authentically creative, and the resulting pastiche was far too allegorical for his taste. I don’t bring up Tolkien lightly, for in addition to the story of little Amelia and Rory, “The Professor, the Queen, and the Bookshop” also stars Lewis and Tolkien. Much like “The Land of Happy Endings,” the comic strip about the eighth Doctor’s dream adventures with his grandchildren John and Gillian, “The Professor” is framed as a story within a story. Amelia and Rory’s adventures with the Professor are shown, on the final page, to be the latest story Lewis presents to his compatriots The Inklings, including their newest members, the Doctor and Amy Pond. Tolkien dismisses the story for all the reasons that Tolkien dismissed the Narnia tales, while the Doctor makes a suggestion that just might improve the tale — turn the space-time traveling bookshop into a magical wardrobe. I get the intent of “The Professor.” I understand the metatextual point that Morris wants to make. Doctor Who, which debuted on the same day that Lewis died, has some similarities to Lewis’ fantasies. The TARDIS isn’t far removed from a magical wardrobe. The worlds the TARDIS visits are just as fantastical as Narnia. The evils the Doctor faces are just as implacable and illogical as the White Witch. I don’t feel that the story reaches its intent, largely because the story is as subtle as a hammer to the head. The artwork, which is up to Davis’ excellent standards, layers on fanwank after fanwank — the bookshop looks like the eighth Doctor’s console room, the book that hurls the bookshop into the vortex bears the Seal of Rassilon, the White Witch resembles the Rani wearing Gallifreyan robes and her headpiece as a Weeping Angel, in addition to fauns and minotaurs the natives of Narnia include the Judoon, the White Witch’s fortress is Rassilon’s tomb in the Death Zone of Gallifrey. Each page bears something from Doctor Who‘s past thrust into Lewis’ world. But because the story keeps making kisses to the past, it never works as a story on its own terms. The problem is, “The Professor, the Queen, and the Bookshop” simply isn’t original, either for Narnia or for Doctor Who. Neil Gaiman touched upon Narnia-as-a-story in “The Problem of Susan,” his remarkable (and remarkably short) tale of Susan Pevensie as an elderly adult. And while I could point to “The Land of Happy Endings” as an example of Doctor Who-as-story, or Rob Shearman’s Deadline, or even Lawrence Miles’ “The Book of the World,” it’s one single scene in Steven Moffat’s “The Big Bang,” when the Doctor tells a sleeping Amelia about his life and all the adventures that they will now never have, Moffat effectively makes the point that Morris wants to make — stories are more than just narratives, they carry with them emotional power and emotional truth. I can see what Morris wanted to achieve with “The Professor, the Queen, and the Bookshop.” As someone who has read and loved the writings and worlds of Lewis and Tolkien for over thirty years, naturally I loved seeing the Doctor having a drink with the two old Oxford dons in The Eagle and Child pub. But the story falls flat for me. It doesn’t reach the heights it so clearly wants to reach. I wish it did.